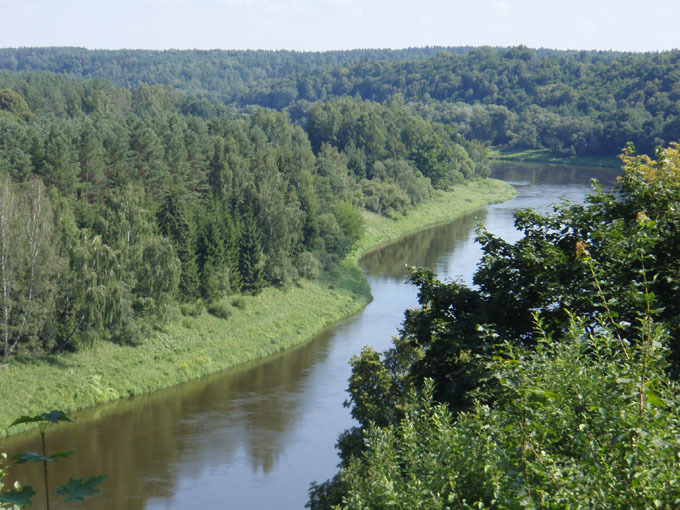 We started the drive north from our abandoned school towards Vilnius past more lakes and through beautiful rolling hills and rural countryside. Just before we left we watched a lady milking her cow. A nice start to the day! The roads are much better than Polish roads with far less bumps and potholes. There are also lots of stopping places for a quick drink or picnic and the other drivers do not tend to overtake in quite the same enthusiastic way! 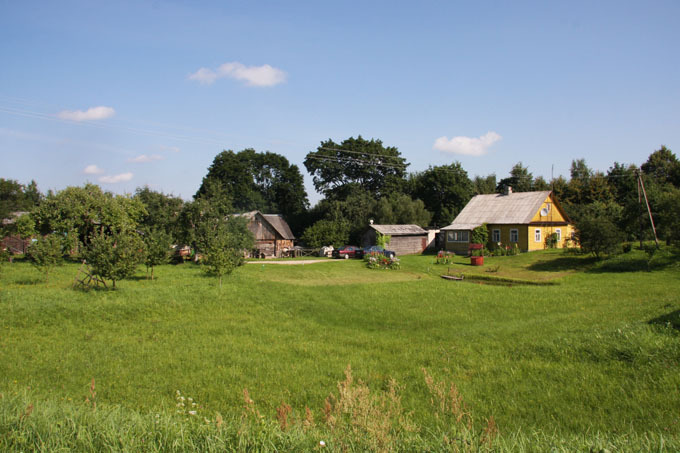 The roads are also very quiet and in the area south of Vilnius and the side roads to the small villages are often unpaved. There are a lot less new houses than Poland in this area. Just off the the A16 we saw a brown sign for a monument. It turned out to be a hill that used to have a fort on. Once on top of the hill there was a nice view of the river below, winding its way through pine woods. We had just stopped along the road to take yet another nice house picture and a man stopped next to us to ask if we needed help. We explained that we had just stopped for coffee and he insisted on escorting us to a good spot. Just goes to show that the Lithuanians are just as friendly as the Polish … great start! 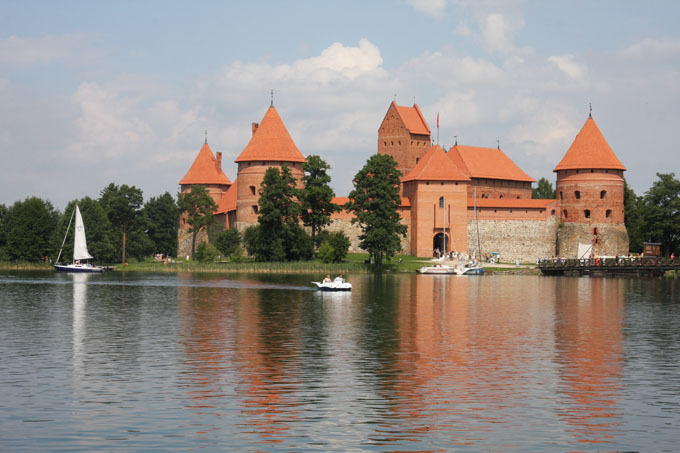 We had seen a photograph in a guide book of a nice looking castle at Trakai about 27km west of Vilnius, and as we had had a special request from John FL in Bridford Devon for a castle with round towers, we thought we ought to get a couple of pictures! It turned out to be a lovely place with a great atmosphere. The castle is on a little island and on a sunny Saturday it was a popular place for locals to visit. There were lots of weddings and hen parties everywhere. Everyone was smiling and laughing and it was great just to sit and watch people go by. Walking along through the stalls on the side of the road were all the normal tourist bits, but one was a bit more unusual. 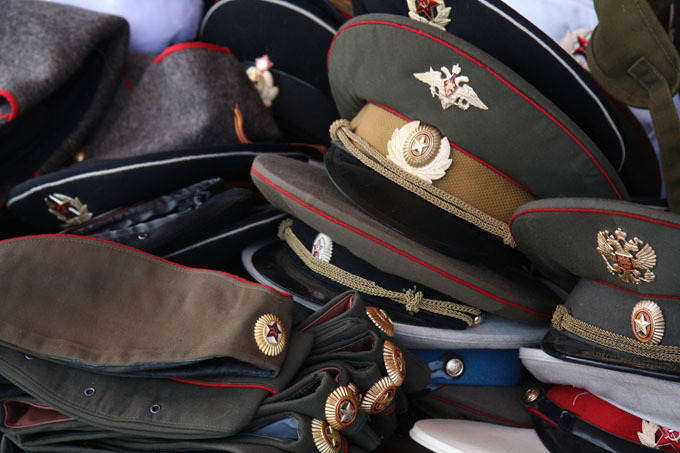 It was just filled with ex military uniform hats and gas masks. Not sure where from, but it made a change! Black clouds started to roll in in the evening, which has been a bit of a pattern over the last couple of weeks, so we headed off to a picnic area by the lake where Marjool cooked a tasty rice dish (Nasi Goreng). Another day gone already! ← 29th July – Lithuania!